Pyruvate dehydrogenase complex (PDC) deficiency (PDCD) is one of the most common neurodegenerative disorders associated with abnormal mitochondrial metabolism. PDC metabolically converts pyruvate into acetyl-coenzyme A (ACoA), one of the first steps in the citric acid cycle (CAC). The CAC is a major biochemical process in the mitochondrial matrix that derives energy from several metabolic substrates, including carbohydrates, fatty acids, and amino acids. Malfunction of this cycle deprives the body of energy. In PDCD, pyruvate, which is derived from the breakdown of carbohydrates, is not converted into ACoA. This decreases the major substrate necessary for the CAC to function and results in an abnormal buildup of lactate and alanine, which are alternative metabolic products of pyruvate. Without function of the CAC, the mitochondria cannot produce energy for the cells to function. Lack of energy product and the buildup of unusable metabolites results in nonspecific symptoms (eg, severe lethargy, poor feeding, tachypnea), especially during times of illness, stress, or high carbohydrate intake. In PDCD, progressive neurological symptoms usually start in infancy but may be evident at birth or in later childhood and very rarely in adulthood. Symptoms may include developmental delay, intermittent ataxia, poor muscle tone, abnormal eye movements, or seizures. Childhood- and adult-onset forms of this disorder are often associated with intermittent periods of decompensation but normal or mildly delayed neurological development. Therapies are suboptimal for most forms of pyruvate dehydrogenase complex deficiency; although resolution of the lactic acidosis may occur, cessation of the underlying progressive neurological damage is rare. The key feature of this condition is gray matter degeneration with foci of necrosis and capillary proliferation in the brainstem in many but not all patients. The group of disorders that result in this pathology are termed Leigh syndrome. Defects in one of many of the mitochondrial enzymes involved in energy metabolism may demonstrate similar brain pathology. Leigh syndrome may be caused by mitochondrial defects other than PDCD. This diagram shows a simplified version of the citric acid cycle and shows the enzyme deficit. The dashed line indicates the blocked pathway and the size of the arrows indicates the relative flow of products. Because pyruvate does not proceed to acetyl-coenzyme A (CoA), it is shunted to other pathways that produce lactic acid and alanine. A deficiency in this enzymatic complex limits the production of citrate. 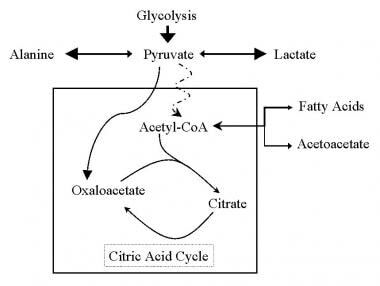 Because citrate is the first substrate in the citric acid cycle, the cycle cannot proceed. Alternate metabolic pathways are stimulated in an attempt to produce ACoA; however, an energy deficit remains, especially in the central nervous system (CNS). The magnitude of the energy deficit depends on the residual activity of the enzyme. Severe enzyme deficiencies may lead to congenital brain malformation because of a lack of energy during neural development. Morphological abnormalities occur before 10 weeks' gestation. Maldevelopment of the corpus callosum is commonly observed in those with prenatal-onset types of PDCD. Progressive neurological deterioration varies in neonates with an apparently healthy brain. Hypomyelination, cystic lesions, and gliosis of the cortex or cerebellum, with gray matter degeneration or necrotizing encephalopathy, may occur in some individuals with PDCD, whereas a gliosis of the brainstem and basal ganglia with capillary proliferation occurs in those with Leigh syndrome. Underlying neuropathology is not usually observed in individuals with a later onset of PDCD. The most common form of PDCD is caused by mutations in the X-linked E1 alpha gene; all other causes are due to alterations in recessive genes. Individuals with neonatal-onset and infantile-onset types of PDCD usually die during the first years of life. Later childhood onset of the disease is usually, but not always, associated with survival into adulthood. All children are born with some residual enzyme activity, because a complete deficiency of PDC is incompatible with life. Infants with 15% or less PDC activity normally do not survive the newborn period. PDC activity greater than 25% is associated with less severe disease and is usually characterized by ataxia and mild psychomotor delay. Some therapies may extend the lives of individuals who are severely affected with PDCD; however, the progressive nature of the neurological deterioration results in significant morbidity. Affected males outnumber affected females, because the most common form of the PDCD is X-linked. Some female carriers may have mild symptoms. There is a wide range of presentation in the recessive forms of the disease, but most are milder than the X-linked form of the disease. PDCD does not appear to have a predilection for race/ethnicity. Males are more commonly affected than females, because the most common form of the PDCD, that of the E1 alpha enzyme subunit, is X-linked. Some female carriers have mild to moderate symptoms because of variable X-chromosome inactivation. There is a wide range of presentation in the recessive forms of the disease, but many are equally as severe as the X-linked form of the disease. West syndrome is more common in females with PDCD. Severe lactic acidosis with early demise and Leigh syndrome are more commonly observed in males with PDCD. Progressive neurological degeneration is also observed in females with PDCD. Age of presentation varies from prenatal to early childhood and depends on the residual activity of the PDC. Individuals with severe disease have prenatal onset with structural brain abnormalities. Moderate disease presents in infants as psychomotor delay. Individuals with less severe disease usually present in early childhood with intermittent lethargy or ataxia. The prognosis of PDCD is proportional to residual PDC activity. In general, the lower the PDC activity, the earlier the onset and the more severe the disease progression. Since the most common form of the PDCD is X-linked recessive, carrier females can have a milder form of the disease, depending on variable X inactivation, whereas males with the X-linked form are more affected. Prognosis also significantly related to whether the form of PDCD is responsive to thiamine or lipoic acid. Individuals with mild deficiencies in the E1 enzyme of the pyruvate dehydrogenase complex have a better prognosis than those with deficiencies in the E2 and E3 pyruvate dehydrogenase complex enzymes. In most cases of neonatal-onset and infantile-onset of pyruvate dehydrogenase complex deficiency, a poor prognosis remains, even when the lactic acidosis is treated successfully. Although lactic acidosis appears to be controlled by thiamine supplementation in individuals who respond to thiamine, the neurological outcome may be poor. Dichloroacetate appears to produce biochemical correction of pyruvate dehydrogenase complex deficiency in many cases, but resolution of neurologic symptoms is exceptional. Structural CNS abnormalities likely cannot be reversed with successful biochemical treatment. Dichloroacetate may have greater efficacy with particular mutations of the E1 subunit. In general, treatment of individuals with pyruvate dehydrogenase complex deficiency is most beneficial if started early. Although successful treatment is rare, some cases have been reported. Although the recurrence rate for subsequent pregnancies is low, test future gestations for pyruvate dehydrogenase complex deficiency because of the possibility of germline mosaicism. Enzyme activity of cultured chorionic villus cells can be determined in time to make an early diagnosis. Inaccuracies in the diagnosis of the female fetus arise from X chromosome inactivation. Individuals with an E2 subunit deficiency may have a mild phenotype. Educate the patient with pyruvate dehydrogenase complex deficiency and the caregivers regarding the factors that may elicit a crisis and the early signs of decompensation. Patient support groups for mitochondrial disorders include United Mitochondrial Disease Foundation and MitoAction. Ostergaard E, Moller LB, Kalkanoglu-Sivri HS, et al. Four novel PDHA1 mutations in pyruvate dehydrogenase deficiency. J Inherit Metab Dis. 2009 Jun 11. [Medline]. Steller J, Gargus JJ, Gibbs LH, Hasso AN, Kimonis VE. Mild phenotype in a male with pyruvate dehydrogenase complex deficiency associated with novel hemizygous in-frame duplication of the E1a subunit gene (PDHA1). Neuropediatrics. 2014 Feb. 45(1):56-60. [Medline]. Patel KP, O'Brien TW, Subramony SH, Shuster J, Stacpoole PW. The spectrum of pyruvate dehydrogenase complex deficiency: clinical, biochemical and genetic features in 371 patients. Mol Genet Metab. 2012 Jan. 105(1):34-43. [Medline]. [Full Text]. Weber TA, Antognetti MR, Stacpoole PW. Caveats when considering ketogenic diets for the treatment of pyruvate dehydrogenase complex deficiency. J Pediatr. 2001 Mar. 138(3):390-5. [Medline]. Patel KP, O'Brien TW, Subramony SH, Shuster J, Stacpoole PW. The spectrum of pyruvate dehydrogenase complex deficiency: clinical, biochemical and genetic features in 371 patients. Mol Genet Metab. 2012 Jan. 105(1):34-43. [Medline]. Giribaldi G, Doria-Lamba L, Biancheri R, Severino M, Rossi A, Santorelli FM, et al. Intermittent-relapsing pyruvate dehydrogenase complex deficiency: a case with clinical, biochemical, and neuroradiological reversibility. Dev Med Child Neurol. 2011 Dec 5. [Medline]. Han Z, Zhong L, Srivastava A, Stacpoole PW. Pyruvate dehydrogenase complex deficiency due ubiquitination and proteasome-mediated degradation of the E1beta subunit. J Biol Chem. 2007 Oct 8. [Medline]. Debray FG, Mitchell GA, Allard P, Robinson BH, Hanley JA, Lambert M. Diagnostic accuracy of blood lactate-to-pyruvate molar ratio in the differential diagnosis of congenital lactic acidosis. Clin Chem. 2007 May. 53(5):916-21. [Medline]. van Dongen S, Brown RM, Brown GK, Thorburn DR, Boneh A. Thiamine-responsive and non-responsive patients with PDHC-E1 deficiency: a retrospective assessment. JIMD Rep. 2014 Apr 10. [Medline]. Stacpoole PW, Kerr DS, Barnes C, Bunch ST, Carney PR, Fennell EM. Controlled clinical trial of dichloroacetate for treatment of congenital lactic acidosis in children. Pediatrics. 2006 May. 117(5):1519-31. [Medline]. Parikh S, Goldstein A, Koenig MK, Scaglia F, Enns GM, Saneto R, et al. Diagnosis and management of mitochondrial disease: a consensus statement from the Mitochondrial Medicine Society. Genet Med. 2015 Sep. 17 (9):689-701. [Medline]. Parikh S, Goldstein A, Karaa A, Koenig MK, Anselm I et al. Patient care standards for primary mitochondrial disease: a consensus statement from the Mitochondrial Medicine Society. Genet Med. 2017 Dec. 19 (12):[Medline]. Al-Essa MA, Ozand PT. Manual of Metabolic Diseases. Saudi Arabia: King Faisal Specialist Hospital and Research Centre, Riyadh; 1998. Brown GK, Otero LJ, LeGris M, Brown RM. Pyruvate dehydrogenase deficiency. J Med Genet. 1994 Nov. 31(11):875-9. [Medline]. Byrd DJ, Krohn HP, Winkler L, et al. Neonatal pyruvate dehydrogenase deficiency with lipoate responsive lactic acidaemia and hyperammonaemia. Eur J Pediatr. 1989 Apr. 148(6):543-7. [Medline]. De Meirleir L. Defects of pyruvate metabolism and the Krebs cycle. J Child Neurol. 2002 Dec. 17 Suppl 3:3S26-33; discussion 3S33-4. [Medline]. Debray FG, Lambert M, Vanasse M, Decarie JC, Cameron J, Levandovskiy V. Intermittent peripheral weakness as the presenting feature of pyruvate dehydrogenase deficiency. Eur J Pediatr. 2006 Jul. 165(7):462-6. [Medline]. Fouque F, Brivet M, Boutron A, et al. Differential effect of DCA treatment on the pyruvate dehydrogenase complex in patients with severe PDHC deficiency. Pediatr Res. 2003 May. 53(5):793-9. [Medline]. Head RA, Brown RM, Zolkipli Z, et al. Clinical and genetic spectrum of pyruvate dehydrogenase deficiency: dihydrolipoamide acetyltransferase (E2) deficiency. Ann Neurol. 2005 Aug. 58(2):234-41. [Medline]. Head RA, de Goede CG, Newton RW, et al. Pyruvate dehydrogenase deficiency presenting as dystonia in childhood. Dev Med Child Neurol. 2004 Oct. 46(10):710-2. [Medline]. Morris AA, Leonard JV. The treatment of congenital lactic acidoses. J Inherit Metab Dis. 1996. 19(4):573-80. [Medline]. Morten KJ, Beattie P, Brown GK, Matthews PM. Dichloroacetate stabilizes the mutant E1alpha subunit in pyruvate dehydrogenase deficiency. Neurology. 1999 Aug 11. 53(3):612-6. [Medline]. Naito E, Ito M, Yokota I, et al. Diagnosis and molecular analysis of three male patients with thiamine-responsive pyruvate dehydrogenase complex deficiency. J Neurol Sci. 2002 Sep 15. 201(1-2):33-7. [Medline]. Naito E, Ito M, Yokota I, et al. Thiamine-responsive pyruvate dehydrogenase deficiency in two patients caused by a point mutation (F205L and L216F) within the thiamine pyrophosphate binding region. Biochim Biophys Acta. 2002 Oct 9. 1588(1):79-84. [Medline]. Pastoris O, Savasta S, Foppa P, et al. Pyruvate dehydrogenase deficiency in a child responsive to thiamine treatment. Acta Paediatr. 1996 May. 85(5):625-8. [Medline]. Shevell MI, Matthews PM, Scriver CR, et al. Cerebral dysgenesis and lactic acidemia: an MRI/MRS phenotype associated with pyruvate dehydrogenase deficiency. Pediatr Neurol. 1994 Oct. 11(3):224-9. [Medline]. Stacpoole PW, Barnes CL, Hurbanis MD, et al. Treatment of congenital lactic acidosis with dichloroacetate. Arch Dis Child. 1997 Dec. 77(6):535-41. [Medline]. Stacpoole PW, Bunch ST, Neiberger RE, et al. The importance of cerebrospinal fluid lactate in the evaluation of congenital lactic acidosis. J Pediatr. 1999 Jan. 134(1):99-102. [Medline]. Zand DJ, Simon EM, Pulitzer SB, et al. In vivo pyruvate detected by MR spectroscopy in neonatal pyruvate dehydrogenase deficiency. AJNR Am J Neuroradiol. 2003 Aug. 24(7):1471-4. [Medline].